Starring: Liam James, Steve Carell, Toni Collette, Sam Rockwell, Alison Janney, AnnaSophia Robb, Maya Rudolph, Rob Corddry, Amanda Peet, Jim Rash and Nat Faxon. 2013 has proven to be a strong year for coming of age dramas with The Spectacular Now, The Kings of Summer and what proves to be the best of the bunch, The Way Way Back. The film from comedy veterans Nat Faxon and Jim Rash, Academy Award winners for their writing on The Descendants, is a heart wrenching and heart-warming story of an incredibly shy and downtrodden young teen finding his voice with the help of a slacker water park worker that may be the only true father figure he’s ever had. While 14-year-old Duncan (James) is being dragged on a family trip with his mom Pam (Collette) and her overbearing boyfriend Trent (Carell), he finds a gregarious friend (Rockwell) at a local water park. The two form a powerful bond as Duncan spends days away from the chaotic and drunken misadventures of his mom and Trent’s friends on ‘adult spring break’ (including Janney, Peet and Corddry). Through the blistering days of summer spent working in the park, Duncan emerges from his shell and even forms a bond with the girl of his dream (Robb). The Way Way Back is almost pitch perfect and feels very organic in tone. Derived mainly from events and happenings from Rash and Faxon’s own childhoods, the film never feels out of sorts or unrealistic even during its most colorful flourishes and excursions thanks to the grounding the writer/directors set their characters up with. James is perfect as the put upon Duncan, from the opening sequence with the slyly devious Trent proclaiming him a ‘3 out of 10’ to his triumphant final moments, James embodies the petrified kid in all of us, just starting to dare step into the limelight. Aping Bill Murray from Meatballs and Walter Matthau’s classic Morris Buttermaker from the Bad News Bears, Rockwell shines as Owen, the man-child so desperate to move forward that he keeps himself stuck in a loop and the ones he loved seem doomed to orbit around him. The rest of the cast is set perfectly as well as there is not a performance that hits a sour note throughout. Particularly strong are Robb in a more adult role than what we are accustomed to see her play, Rudolph in a sparse yet hilarious turn as Owen’s girlfriend and Collette’s Pam shows an understated sense of desperation and strength that grows throughout the film. Carell nearly steals the entire film though, playing a slime bag of the upmost contempt, a role that he pulls of so well yet is nothing like anything he has ever played before. The Blu-ray comes equipped with a full making of feature, deleted scenes and a handful of featurettes including a tour of the water park, a history of Jim and Nat and another on the ensemble on screen in the film. 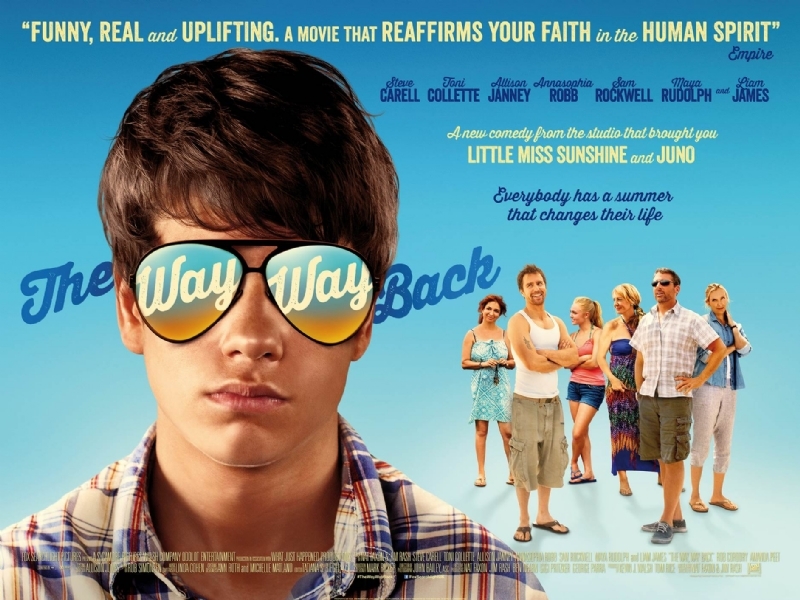 The Way Way back is the type of film that is easy to revisit, and revisit often, and like the coming of age films of past decades like the Goonies, Clueless and even the recent Easy A, will likely stay that way for decades to come. The Way Way Back is very strong recommend.